ANCONA, ITALY – At Seven Seas Splendor’s keel laying, 28 June 2018, at the Fincantieri shipyard in Ancona, Italy, two extraordinary full-size suite models provided a first look at the ultimate accommodations and attention to detail guests will enjoy when the luxury ship debuts in 2020. Ancient Roman Empire Coin, featuring Neptune, God of the Sea. The coin was minted during the reign of Hadrian (117 to 138 AD) and commemorates the ship being built in Italy and the origin of the coin tradition. Spanish Gold “Escudo” Coin from the 1700s, commemorating Seven Seas Splendor’s inaugural voyage on February 7, 2020, taking guests on an unforgettable 14-night transatlantic journey from Barcelona, Spain to Miami. This Spanish Escudo will signify good luck on her first official voyage. A Commemorative Coin, etched with the date of the keel laying ceremony, illustrating the partnership of Regent Seven Seas Cruises and Fincantieri. During the ceremony, the first two of 210 blocks that will comprise the approximately 55,000 gross ton vessel were lifted into the dry dock, officially marking the start of the ship’s assembly in the Ancona shipyard. Seven Seas Splendor is an all-suite, all-balcony ship, offering up to 750 guests the most elegant accommodations. Guests will enjoy distinctive public spaces as well as 375 beautifully appointed suites ranging from the 307 square-foot Veranda Suite, to the lavish 4,443 square-foot Regent Suite. With a private in-suite spa with steam room, a custom heated spa on a private balcony, and ceramic heated lounge beds, the Regent Suite also comes with a butler and car and driver awaiting excursions in every port. 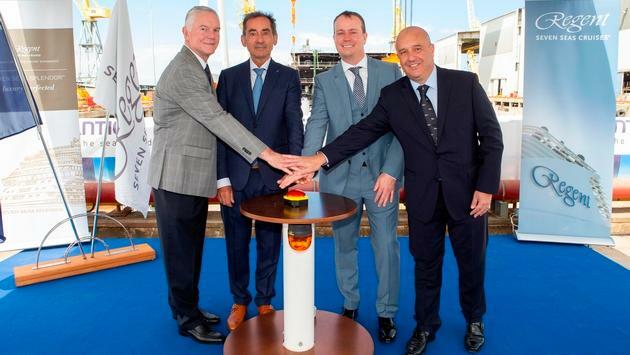 Keel laying ceremony attendees toured full-size Concierge and Penthouse suite models at the Fincantieri shipyard, representing a majority of the suites on board Seven Seas Splendor. Senior members of the Operations team at Regent Seven Seas Cruises and Fincantieri, as well as the architects and designers, leverage these models to perfect every detail for each suite, ensuring accommodations are perfect when suites are constructed. “We designed these suites, and the entire ship, with meticulous attention to every detail. The thickness of a door knob, the sleekness of a headboard, the style of a chair, every detail has been thoughtfully considered to create a ship that perfects luxury,” said Robin Lindsay, executive vice president of vessel operations for Norwegian Cruise Line Holdings Ltd. Upon opening reservations for Seven Seas Splendor’s first 10 voyages, Regent Seven Seas Cruises had the best single booking day in the company’s 26-year history. With such remarkable interest in Seven Seas Splendor, the company will move up the opening of Seven Seas Splendor’s 2020 inaugural European summer itineraries to 12 July 2018. Αναρτήθηκε από geop στις 8:18 π.μ.